Indonesian guitarist Dewa Budjana has adopted a much more loose and improvisational style on his seventh solo endeavor (and his third for Moonjune), much of which was recorded in Los Angeles in January and October 2013. 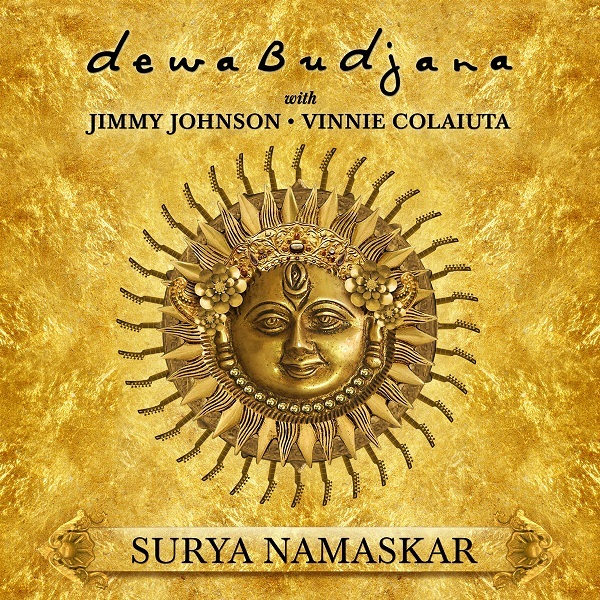 The eight cuts on Surya Namaskar are full of surprises with each new spin, and after at least a couple dozen plays I’m still in awe of what’s gone down in these sessions. Having master fretless bassist Jimmy Johnson (who hasn’t he played with?) and former Zappa drummer Vinnie Colaiuta on board as his primary sidemen certainly doesn’t hurt, as Budjana easily rises to match their level of mastery. Even Allan Holdsworth’s keybord player Gary Husband is guesting on the opening track “Fifty,” and Michael Landau shares the guitar spotlight on the album’s title track. Three additional players are featured on Sundanese (Western Java) harp and violin, and vocals, on the Indonesian flavored “Kalingga,” where Budjana plays a heavily fuzzed and sitar effected guitar before launching out into a more conventional jazz idiom, then alternating back, bridging his ethnic traditions to western styles on the album’s most unique cut. The closer, “Dalem Waturenggong,” in another similar bridge of traditional and jazz, but only involves the core trio. Every track here is fully composed and arranged by Budjana, and more than anything this time he is offering a more spontaneous and uninhibited approach to playing, which is a marked difference from the two previous Moonjune releases Dewai in Paradise and Joged Kahyangan which tended to be a bit more restrained, though technically and artistically excellent. For anyone not yet familiar with Budjana, Surya Namaskar is the place to start.